When we introduced Bert to our friendliest goats, he wasn't interested. He cried and stuck very close to the gate – he wouldn't even budge for treats. So we let him out to roam, hoping it would help in calm down. That’s when Bert showed us exactly why he’d been so sad. Bert ran straight to Bubbles in the sheep pasture and nuzzled her affectionately – he just wanted to be back with his best friend! So Bert moved in with Bubbles and the rest of the sheep, and has been very happy ever since. Have you visited us and seen the big-headed goat in with the sheep? That's Bert, and he loves to hang out with his best sheep friend, Bubbles! 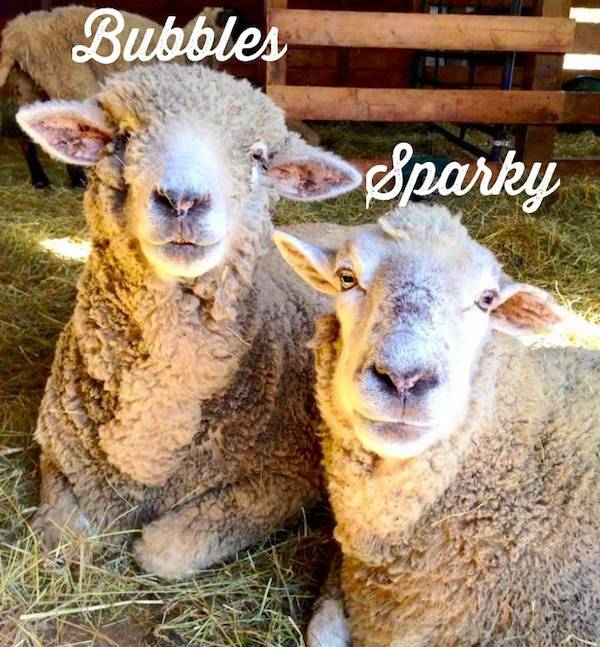 Because of your support, they live a life filled with love and friendship here at Woodstock Farm Sanctuary. Usually, goats prefer to live with goats, and sheep with sheep. 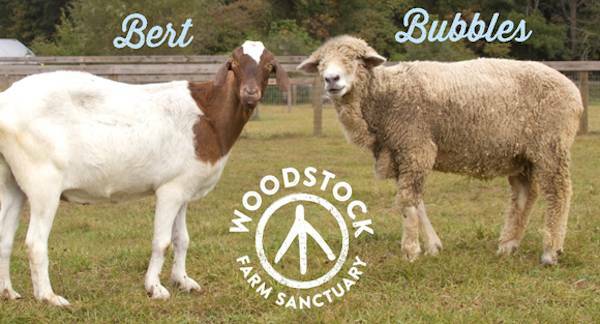 Although Bert and Bubbles had lived together before they came to the Sanctuary, we were excited for them to make new friends with their own kind. When we introduced Bert to our friendliest goats, he wasn't interested. He cried and stuck very close to the gate – he wouldn't even budge for treats. So we let him out to roam, hoping it would help in calm down. That’s when Bert showed us exactly why he’d been so sad. Bert ran straight to Bubbles in the sheep pasture and nuzzled her affectionately – he just wanted to be back with his best friend! So Bert moved in with Bubbles and the rest of the sheep, and has been very happy ever since. Like humans, animals form very close friendships and and greive when separated. Sadly, goats and sheep raised for meat and wool are not allowed to be themselves or develop these lifelong friendships. We are so grateful that you are giving Bert and Bubbles the chance to live a happy life together as part of a close-knit family. And they’re enjoying very long lives – Bert is 13 and Bubbles is 14 – which is when old animals need a lot of extra care. And they deserve it! Each year it costs $4,000 to give Bert and Bubbles the best medical care – that's $12,000 since they've been here. You are at the heart of every life we save and it is because of you that we are able to continue. Friends like Bert and Bubbles are counting on you, so please donate today to give others the same chance at happiness and friendship.